I knew I wanted a truly’ 60s-style sound not unlike that in a Lost in Space episode because the movie had a very unique look and color about it and the humorous (though more contemporary) subject matter dictated a VERY untraditional approach. 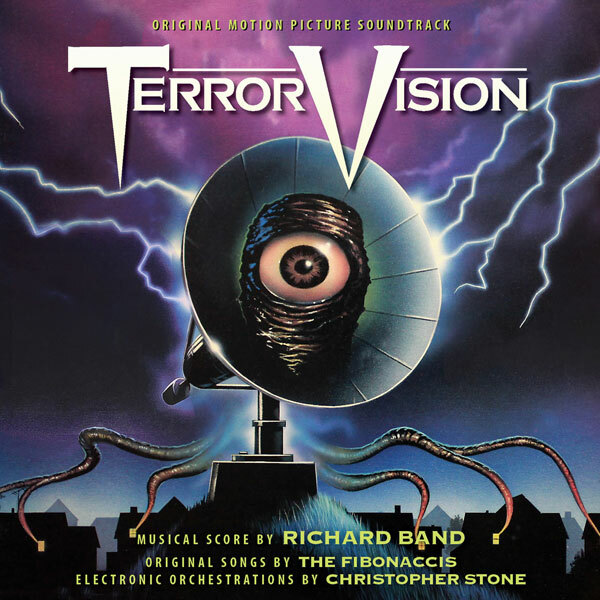 Richard Band approached his scoring of Empire Pictures’ cosmic sci-fi/monster vehicle TerrorVision (1986), produced by family members Charles and Albert Band, with an array of synthesized colors—both tonal and otherworldly—in keeping with the quirky tale of the Putterman family and their monster-inhabited TV set. Restless Records issued a short-lived LP in 1986, with one side devoted to the five vocal and instrumental tracks written and performed by The Fibonaccis and the other side offering highlights from Richard Band’s original score. For the premiere release of this score on CD, Intrada accessed the original ½” three-channel and 2” eight-channel session masters recorded by Christopher L. Stone, and created all-new stereo mixes, allowing Intrada to add a substantial amount of previously unreleased music. In the film, an alien garbage disposal converts a monsterous mutant into energy and beams it into space, where it is received via a new satellite dish set up in the Putterman's back yard. Three kids try to take care of it to prevent it from going on a hungry rampage. Wow, I remember that film!